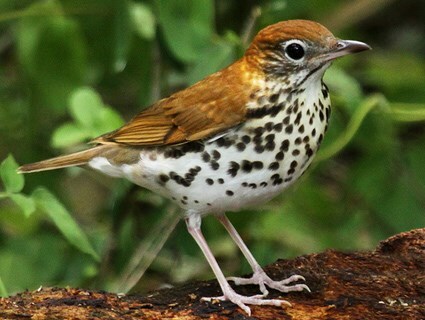 My favorite singer in the woods is the wood thrush. The Wood Thrush's loud, flute-clear ee-oh-lay song rings through the deciduous forests of Songbird Prairie Inn and Spa in summer. 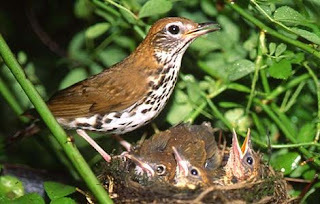 You'll likely hear the Wood Thrush before you see it. This reclusive bird's cinnamon brown upperparts are good camouflage as it scrabbles for leaf-litter invertebrates deep in our woods, though it pops upright frequently to peer about, revealing a boldly spotted white breast. Juveniles show a somewhat muted version of the same pattern. All have a bold, white eye ring. Though still numerous, its rapidly declining numbers may be due in part to cowbird nest parasitism at the edges of fragmenting habitat and to acid rain's depletion of its insect prey.